You know the Infinity Gauntlet? That big glove in the Marvel Cinematic Universe specifically designed to hold all six infinity stones and turn the wearer into basically a God? Well, eagle eyed Marvel fans have been confused by something about it for a while now and Thor: Ragnarok finally clears all that up. We first saw the Infinity Gauntlet in the background of Odin’s Trophy Room in the first Thor film when The Destroyer was popping off against the Frost Giants. Notice this one is a right handed gauntlet. Why is this important? Well, the next time we see the gauntlet in the MCU was in the Avengers: Age of Ultron mid credits scene. Thanos puts on his gauntlet (Avengers: Age of Ultron, 2015). In that scene we saw chirpy purple fella Thanos reach into a vault and put on the Infinity Gauntlet. Thanos is going to be a big deal in the upcoming Avengers: Infinity War films because he’s really into Infinity Stones. So, in this scene we see that Thanos already has an Infinity Gauntlet BUT how can that be when we saw the Infinity Gauntlet in Odin’s Trophy Room? Marvel’s Kevin Feige had previously said that were two Infinity Gauntlets in the MCU but didn’t say why. Cate Blanchett as Hela (Thor: Ragnarok, 2017). 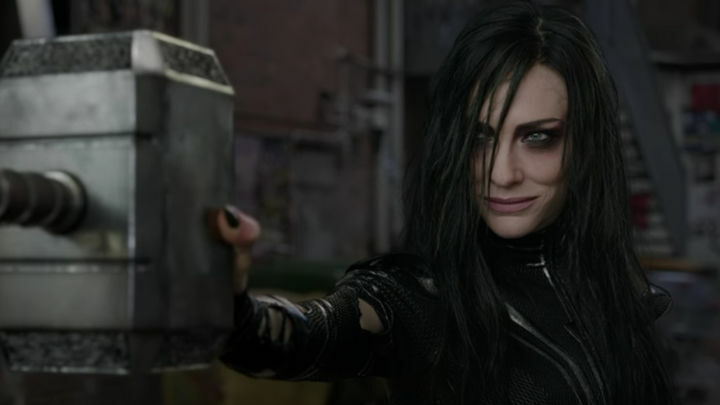 Fast forward to Thor: Ragnarok and we see Hela strutting around Odin’s Trophy Room and revealing that a lot of the trophies are actually fake – especially the Infinity Gauntlet which she knocks over. This probably explains why it has replica Infinity Stones inside of it and why it’s a right handed glove when we see Thanos picking up a left handed glove. Way back when they were making the first Thor, Marvel probably couldn’t have known that this little easter egg would end up being a bit of an annoying plot hole but now that’s all been cleared up so you can stop writing to Kevin Feige about it.